Enter one John Lennon, former member of this small British group called The Centipedes or something. When the band finally called it quits in 1968 - 1970 (yeah, it was kind of a process), Lennon decided that he, too, needed to experience this same kind of reinvention. He and wife Yoko Ono eventually packed up shop and headed to the Big Apple in the early 1970s, and would proceed to record what, to this day, is some of my favorite true rock and roll music ever put to vinyl. With this also came a desire to ditch the Beatles persona, and the look that came along with it. How’d he manage that? Well, let’s take a look at three distinct outfits he sported during the years there and find out. On the now iconic cover to the Live in New York City album, John can be seen wearing a military shirt-jacket that is also seen in a number of other photographs. The jacket is, arguably, the second most iconic piece of clothing the man wore post-Beatles (we’ll see the first in a second), and has a really interesting story behind it, too. In the late 1960s, John was approached in an airport by a gentleman who claimed to have just gotten out of the Army in Vietnam (though the patches on the jacket actually indicate it was worn in Korea, not Vietnam). He told John that he had a bunch of his old issued clothes he didn’t want to keep, and wanted to give them to John to wear or otherwise incorporate into some kind of art. John accepted, and the rest is history. ﻿L.L. Bean makes a mean work shirt. This one, featuring button down breast pockets and epaulets, comes in the typical olive drab associated with military wear. Being on sale for $34 definitely helps the cause some, that’s for sure. 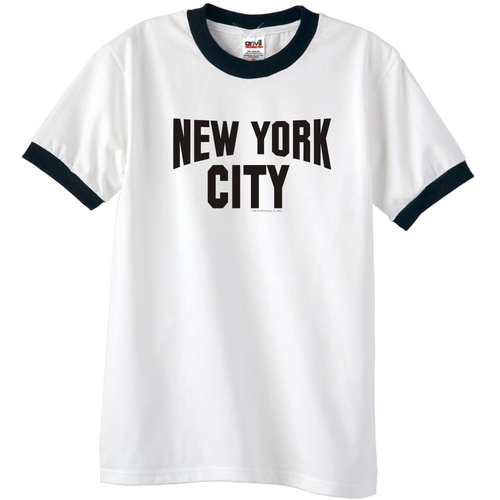 Here we have perhaps the single most iconic piece of clothing John Lennon has ever worn: his New York City shirt. The photos of him wearing this shirt have been used on everything from posters to compilation albums to other t-shirts. In many ways, this is the representation of John in New York, and for once, you don’t have to hunt particularly hard to find it. There are a number of online retailers who offer replicas of this shirt, at varying price points, but the one I found at NYC Webstore just felt the most appropriate given the story involved in John wearing the shirt anyway (photographer Bob Gruen picked it up for $5 from a street vendor and cut the sleeves off because he hated the look of the black ringers). There’s something totally inconsequential about the fact that this was the shirt he chose, among likely dozens of other “I <3 New York” options, and many of those options also exist on the NYC Webstore site, so it just felt like a good fit. 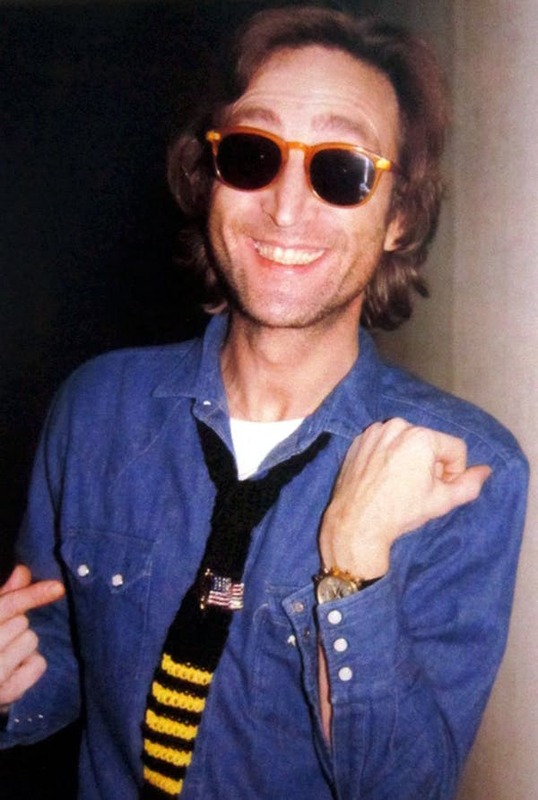 While our guts point us in the direction of Lennon being the hippie, the anti-war, anti-consumerist type whose sole mission in life was to try and use music to bring peace, around the time he turned 40 in 1980, also the year he would be tragically shot and killed, he started to sharpen up some. One of the things that meant was dressing a bit more the way he wanted and not letting cost or image influence it, and trend he’d begun dabbling with a few years prior but didn’t fully embrace until the start of the new decade. And on his 40th birthday, it’s been assumed, wife Yoko Ono gifted him not only the American flag pin seen above (which, by the way, cost $75,000 in 1980 money because of the stones and gold), but also his new watch, the Patek Philippe 2499 in gold (whether yellow or pink is unclear). This offering from Frederique Constant is, admittedly, lacking the chronograph function of Lennon’s Patek, but at a price of $443 USD, it’s safe to say it’s a reasonable trade off. Using a Swiss quartz movement to power the watch enables the timepiece to feature an actual moonphase indicator at 6 o’clock, rather than the more traditional day-night indicator that is found on mechanical watches at this price. It’s a great option, but if you’re willing to go pre-owned, and have a bit more dough to spend, then I may just have the perfect alternative. Meet the Zenith El Primero Chronomaster Moon 17.0240.410/01, otherwise known as the Chronomaster Triple Date Moonphase. This is a now-discontinued Zenith model that is absolutely on my grail list, no doubt. It features, as the name suggests, a triple calendar complication and moonphase as well as a chronograph, making it functionally the same as John’s watch. Featuring many of the same design ques as well, the watch offers a ton of value, especially when you factor in that they can typically be had for between $5,000 and $7,000 depending on things like condition and whether they come with their original box and papers. This model comes in 18k rose gold, but there is a steel model that can be had even cheaper if you hunt. So there we have it - the end of our magical mystery tour through the style of John Lennon, certified New Yorker and former Beatle. There’s no real style lesson to be had here except that you can, and should, let your wardrobe be influenced not only by your life, but by the place you call home. Whatever that means for you, or while you try to figure it out, here are three Lennon solo tracks to keep you company while you do. “New York City” - How appropriate, I know, but this is easily one of my favorite Lennon songs. It’s just such pure rock and roll, and you can hear how much fun he’s having on it. “I'm Stepping Out” - Another super fun rock and roll track, this time from his final record, Milk and Honey. It’s just...it’s just so good, and it all feels like he’d finally found his groove again, unfortunate given the fact that he would never get to ride that groove any further than this record. “Instant Karma! (We All Shine On)” - I’m sure most of us know this one, but it’s one of those well-known Lennon solo tracks that still feels fresh and invigorating to me, even after all these years, so it gets a spot on the list.